Providing efficient hand-drying with less waste, these multi-fold paper towels from Kimberly Clark are soft and highly absorbent. This order of white multi-fold towels includes 16- 250-towel packs (4,000 towels) in a compact carton that is easy to store. As an added benefit, these paper towels are compatible with any tri-fold or multi-fold dispenser, which will help to prevent overuse. 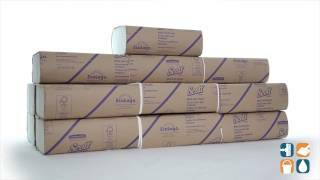 Scott white mult-ifold paper towels meet EPA standards and are EcoLogo certified. Each hand towel measures 9-1/5" x 9-2/5" and is the perfect size for thorough hand drying. CleanItSupply.com offers these Scott Multi-fold Paper Towels at an affordable price no competitor can match so take advantage of this offer today!